Corop is a rural locality at the intersection of the Midland Highway and the Waranga Western Channel in northern Victoria. It is 15 km south-east of Rochester. Corop was the name of a pastoral run taken up by Edward Curr in 1843. It is thought that the name was derived from an Aboriginal word meaning the call of the brolga. The shallow waters of Lake Cooper, about one kilometre south of Corop, were a habitat for brolga and other water birds. Corop also had the offices of the local water works trust during the 1880s, and a butter and cheese factory was opened in 1893. 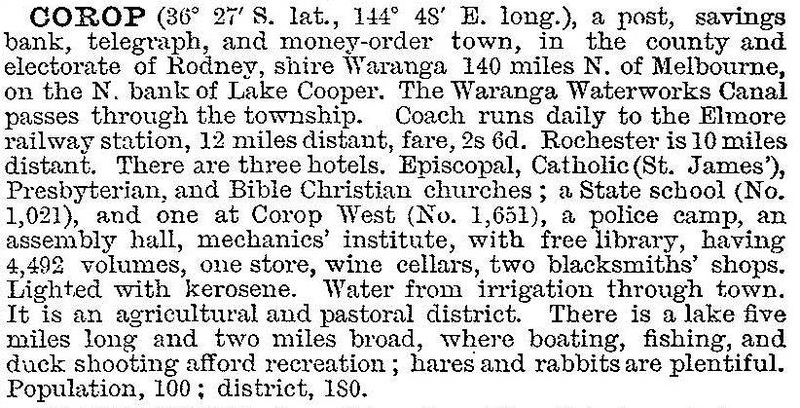 The Waranga Western irrigation channel (1909) passes near Corop and irrigates crops, notably tomatoes. Corop has since diminished as a local commercial centre, although the general store continues. The library with 4000 volumes was recorded as existing into the 1960s; other recreational facilities have substituted, outdoors on Green Lake, north of Corop, and tennis courts in the recreation reserve. The former school, Anglican church and Presbyterian church are privately owned. South of Corop there are the Lake Cooper winery and the Corop wetlands. At the 2011 census farming and horticulture accounted for 49.6% of employment.